Manchester United legend and coach Michael Carrick has discussed the possibility of one day managing the club he played for for the bulk of his career. The 37-year-old only hung up his boots at the end of last season, so will surely not really be in a position to take on such a big job any time soon. 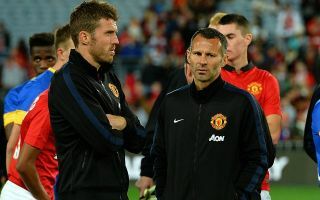 However, that will not dampen the speculation as Carrick would no doubt be a favourite among United fans to one day take charge of the Red Devils given his connection to the club after so many years of great service. A vital cog in some of Sir Alex Ferguson’s best teams, the former England international won five Premier League titles and the Champions League as well as a number of other major honours in 12 years at Old Trafford. Man Utd blog Stretty News recently listed him as an ideal candidate to replace the struggling Jose Mourinho, but the man himself was quick to distance himself from such talk. ‘I don’t want to throw that out there and say I’d want to be United manager,’ Carrick told the Times.